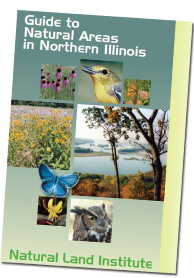 In July 2011 the Natural Land Institute protected Pecatonica Woodlands, 230 acres of original bottomland forest, oxbow lakes, marsh and restored wetland. This critical wildlife habitat lies between land protected by the Winnebago County Forest Preserve and land owned by the Illinois Conservation Foundation. It creates a 1,425-acre complex of permanently protected forest and wetland along the river. More than 100 species of birds have been found in the forests, marshes and meadows, including pileated woodpeckers, scarlet tanagers, Cerulean warblers, bald eagles, sandhill cranes, and American white pelicans. The spring wildflowers in the forest include large patches of blue-eyed Mary, bluebells, woodland phlox and trillium. Stands of white oak, red oak and pin oak intermix with black maple and sugar maple, hackberry and walnut that represent the original hardwood forests that were cut to make furniture by local cabinet makers and carpenters. Funds to acquire the land and the conservation easement were contributed by our members and from grants by the Illinois Clean Energy Community Foundation and the Grand Victoria Foundation’s Vital Lands Illinois program. Assistance with the restoration of the former cropland is being provided by the U. S. Department of Agriculture’s Conservation Reserve Program, the Winnebago County Soil & Water Conservation District, the local chapter of Pheasants Forever, Ducks Unlimited and the Illinois Conservation Foundation. Thank you to all of our members who contributed to this important land protection project. From Telegraph Road near Pecatonica, Illinois, turn north on Wiegert Road. Turn northwest on Cook Road and continue on a gravel Road until you reach a 4-car parking area.